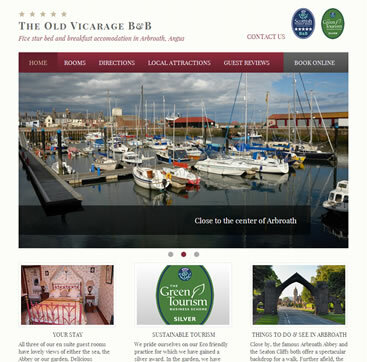 The Old Vicarage in Arbroath were unhappy with their existing website, the site was perfectly adequate when it was developed in 2006 but had been left behind by advances in technology. As one of the highest rated bed & breakfasts in the Angus / Perthshire region, Loris felt it was important that the website reflected the high standards she maintains that have enabled her to gain a 5 star rating and many positive traveller reviews on TripAdvisor. Loris is passionate about sustainable tourism so we made that a key part of the website, we also added sections for local attractions and guest reviews that can be easily updated. Online booking is something that had become essential in the last 5 years for any business offering accommodation, so we made sure the “Book online” call to action was prominent. Finally, as the website was to be a resource for her guests after booking, it was essential it worked well and looked good on mobile phones – the phone number is a link that will dial the number to help travellers out and about find their way to their accommodation. In addition to the website, we created a printed menu for Loris that shows guests where the various ingredients are sourced locally. Guest reviews can be easily added and updated.